Q. Normally when I enter data, I enter across and not down. However, when I press Enter, it automatically goes down instead of across. Is there any way to change that? A. There is! Click File, Options, and Advanced. The first check box allows you to choose whether the cursor moves down, to the right, left or up when you press the Enter key. Set this to Right to make your cursor go where you want it to. Depending upon how long you’ve been using the Enter key in Excel to move to the next cell, it may take some getting used to. If you’ve always reached for the mouse to navigate back up and right to the cell you were just editing, it can be a bit frustrating. Give it a few days. Soon, the inconvenience will be replaced by the ease of having things work the way you like them to. Q. I ignored a bunch of green error triangles, but now I’m not sure I should have. Is there any way to reset those once you’ve ignored them? A. You bet! In options (File, Options) click the Formulas category on the left. Look in the Error Checking section for the Reset Ignored Errors button. Click that, and your green triangles will all come back. Q. My co-worker can copy formulas down by clicking and dragging from this little box in the lower right corner of the cell. Why don’t I see this on my screen? A. This option may have been turned off to avoid screen clutter. You can turn it back on by clicking on the File tab, selecting Options and then Advanced. 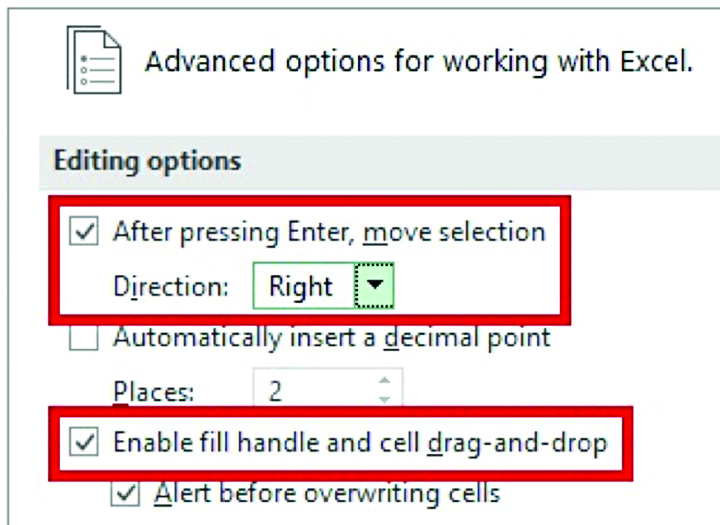 The third check box down reads, “Enable fill handle and cell drag and drop.” Checking this box will make that small box in the lower right corner of a cell you’ve selected appear. Using this to AutoFill down will cause an AutoFill Options box to appear, where you can select context-sensitive options to affect what you’ve just filled.